Spectacular finish of the humanitarian initiative “Croatian Heart for Italy”, Vukovar, 02.07.2012. The football team of the CRO UNUM Charitable Society and the NK Vukovar club played a humanitarian exhibition match in front of a packed City Stadium in Vukovar (2000 people). Prior to the match itself, the Italian Ambassador, H.E. Emanuela D’Alessandro was handed a 100.000,00 kuna check for the victims of the earthquake by the President of the CRO UNUM Charitable Society, Prof Dragan Primorac, the Mayor of Vukovar Željko Sabo, the Prefect of the Vukovarsko-srijemska County Božo Galić, the President of the Association of Children of Killed and Missing Defenders of the Homeland War Jelena Zera Gavrić, the President of the Management Board of Podravka Zvonimir Mršić, the Executive Vice-president of Agrokor and the Vice-president of the CRO UNUM Ante Todorić, the Vice-president of the CRO UNUM Jako Andabak. At the same time, the companies Podravka and Agrokor pledged to provide several hundred thousand kuna worth of food and other necessities to the victims. Before the game, singer Đani Stipaničev performed the anthem of the CRO UNUM Charitable Society, titled “I love you, Croatia” and composed by Neno Ninčević. The rest of the program saw performances from Alen Nižetić and Goran Karan, as well. Among the players who appeared on the field for the CRO UNUM football team were: Igor Štimac, Zoran Mamić, Dario Šimić, Joško Jeličić, Robert Kovač, Đani Stipaničev, Alen Nižetić, Goran Karan, Luka Vidović, Tomislav Madžar, Ivica Šurjak, Robert Špehar, Veljko Mršić, Franjo Arapović, Dragan Primorac and many others. In the second half of the tied game, the Mayor of Vukovar Željko Sabo switched sides with the President of the CRO UNUM Charitable Society, prof Dragan Primorac, who then scored a penalty kick for the NK Vukovar team. The overall spectacle somewhat outshone the final host’s victory, but it did not seem to matter as the members of the CRO UNUM Charitable Society and the present citizens of Vukovar joined in celebration. 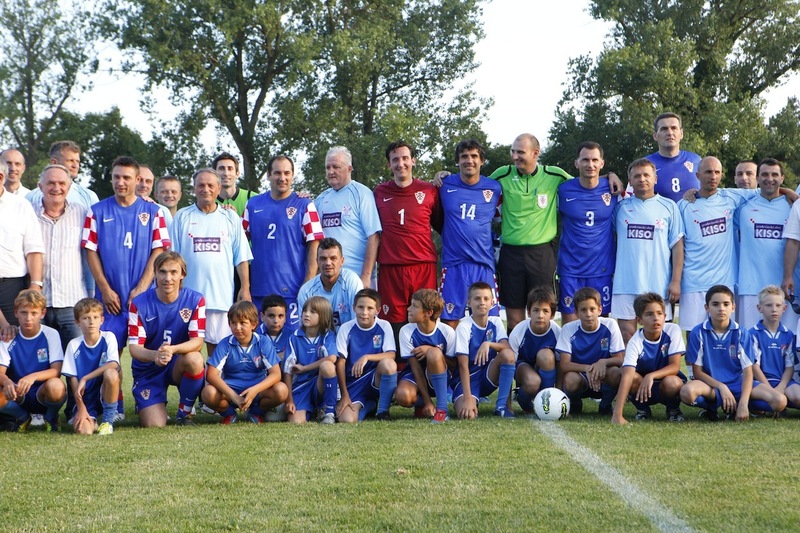 The humanitarian initiative “Croatian Heart for Italy” was organized by the largest Croatian Charitable Society CRO UNUM, the City of Vukovar, Vukovarsko-srijemska County, the Association of Children of Killed and Missing Defenders of the Homeland War, the Croatia Football Federation in cooperation with the Italian Embassy. The Croatian companies and institutions: Agrokor, Podravka, Privredna banka Zagreb, Croatian Employer’s Association, Eye Clinic Svjetlost, Piramida and the City of Knin, joined the initiative as donors and sponsors. The humanitarian aid raised in the course of the “Croatian Heart for Italy” event will go to the Croatian Red Cross to be passed on to the friends of Vukovar in Italy whose cities and villages have recently suffered a destructive earthquake, and who are well remembered for their help to the citizens of Vukovar during the Homeland War. Posted on Wednesday, July 4th, 2012 at 2:07 pm. Filed under: novosti-en RSS 2.0 feed.